One of our readers sent us an issue concerning the #iphone 6 which we would like to tackle today. The phone is getting an unknown error occurred (9) error code when trying to restore the device. While #Apple has already listed the steps that needs to be done whenever you encounter this error on the phone it appears that in this particular case the troubleshooting steps don’t help. Read on below and see what the problem is. Problem: the phone used to reboot after it goes into sleep mode. and then enter into a reboot loop. after reading on here to restore the phone i went through all the steps to no avail. i finally was able to get the phone to boot up randomly and decided to do a factory reset. that sent the phone into a frenzy. i can’t get it to boot up now at all. i got the phone into recovery mode and plugged it into itunes. 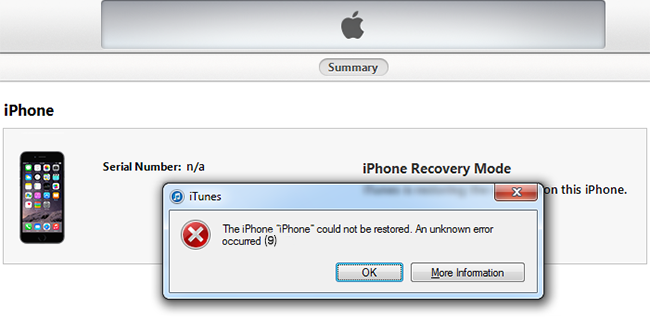 when it says its restoring, it ends up with an error of “the iphone could not be restored. an unknown error occurred (9). after looking at the more information tab and doing everything it recommends. i still cannot get it to work. anything else to try? or should i just have a tech look into it? Solution: Have you already performed the recommended troubleshooting steps for this particular issue? Listed below are the steps that you need to do. Force your device to restart. If the problem still occurs after doing the steps listed above then you should bring your phone to an authorized service center and have it checked.